The India Bike Week is right around the corner, and with it, many manufacturers are gearing up to showcase their strength to the masses. The latest addition to this is BMW Motorrad, which is set to unveil the new BMW K1600B and the brand new 2017 BMW R nineT Racer on November 24, 2017. Except for the chopped windscreen and the tubular handlebars, the BMW K1600B shares a lot of similarities with the K1600GT. The rear sports a signature “bagger profile” design with a lowered passenger seat, two long mufflers and fixed 37-litre hard bags with built-in tail lights and power cords. Some of its standout features include ride-by-wire technology with three riding modes - Rain, Road and Dynamic, which can be selected via a 5.7-inch TFT screen. Along with this, the standard model also gets heated grips and seat, cruise control, powered windscreen and ABS Pro with cornering optimisation. In terms of numbers, the BMW K1600B is powered an in-line 6-cylinder, oil and water-cooled 1649cc engine. This unit produces 160PS of power at 7750rpms and 175Nm of torque at 5250rpm. So, if you’re someone who wants to pack their bags and hit the road for a while, this could be the ideal bike for you. The other motorcycle that the German bikemaker will be dispalying at the event is the 2017 BMW R nineT Racer. The 2017 Racer is the latest addition to BMW’s Heritage family, and boy it's a looker! 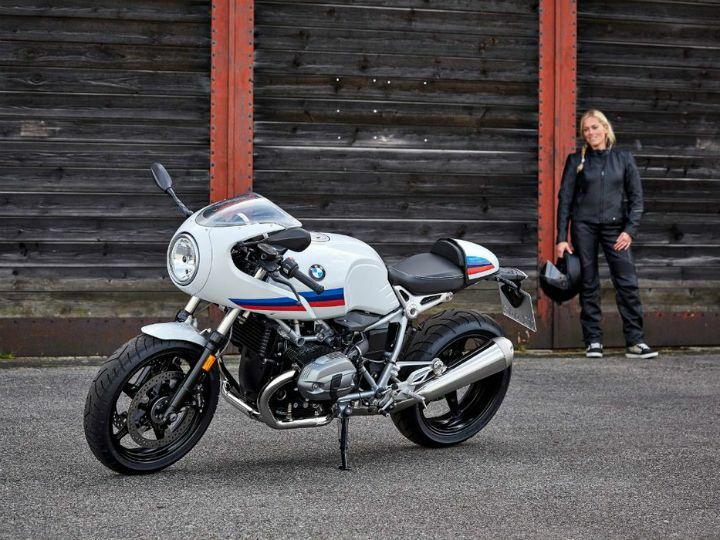 The R nineT Racer (pronounced R ninety) features a retro front cowl, a big single headlight and tri-tone BMW Motorsport colour scheme which brings out the beautiful bodywork of the cafe racer. It will be targeted mostly towards old-school motorcycle enthusiasts, and maybe even a few hipsters. This 70's era-inspired motorcycle is powered by a 1170cc, air and oil-cooled, flat-twin engine. This boxer engine churns out 110PS of power at 7750rpm and 116Nm of torque at 6000rpm. Apart from BMW, many other bike makers are also expected to showcase their latest and greatest offerings for the Indian two-wheeler market this weekend. So, stay tuned for our coverage of the 2017 India Bike Week as we will be reporting live from the event.